This is a form of nerve injury which include complete or partial nerve transaction from cutting (laceration), shearing, compression, stretching or the crushing injuries. There are several kinds of nerve injuries and they are ranges from severe to mild ones, but this particular one is known as the mildest form of nerve injury. Just read down to learn more about this condition. The word neuropraxia is coined from apraxia, which simply means impairment or loss of ability to carry out some complex and coordinated movement with no sensory or muscular impairment. It is also defined as peripheral nervous system disorder, with temporary loss of sensor or motor function as a result of nerve conduction blockage. This condition mostly last for an average of 6 to 8 weeks before a patient can recover fully. In fact, this is known to be the mildest form of nerve injury which usually recover with the passage of time. 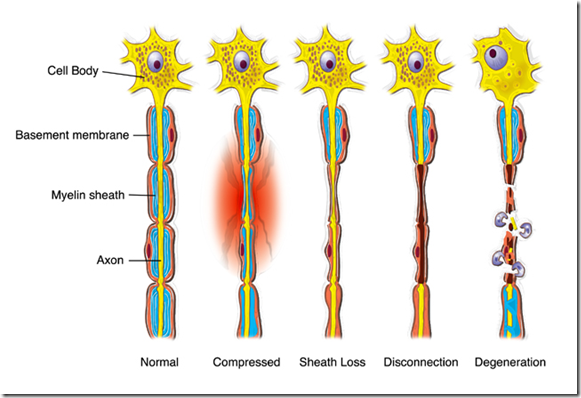 In this condition, the axon usually remains in good condition, but with damaged myelin may cause interruption in generation of impulse through the nerve fiber. Have you ever wondered the possible causes of Neuropraxia? It can be caused by several factors and the major one is mounting pressure on the nerve. While pressure in the nerve is good for important cardinal functions, the increase in pressure is known to be responsible for this mild form of nerve injury, Mounting more pressure on the nerve may disrupt its neuronal transmission leading to mild impairment of some neuronal functions . Good thing is that this is mild nerve injury can easily get healed within few weeks or months.In some cases if prompt intervention is required otherwise condition may become worst. - Proper medications that will help to control the immune system.